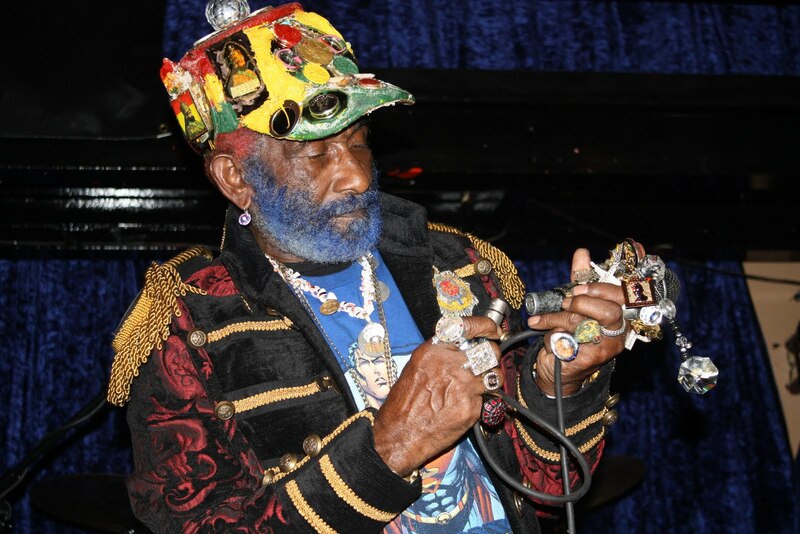 Lee “Scratch” Perry, the dub, reggae and hip-hop pioneer who has lent his signature sound to everyone from Bob Marley to The Clash to the Beastie Boys, has been a feverishly productive producer. And somehow he finds time to make art, as well. In 2010, he had his first art show in Los Angeles and now he’ll be in the house for his first NYC show tonight. If you’re familiar with Perry’s psychedelic dubs and surrealist steez (Keith Richards called him the “Salvador Dali of music” in a Rolling Stone profile titled “Reggae’s Mad Scientist”) you won’t be surprised to learn that his art tends toward the bold, colorful and iconoclastic. Keeping Style Alive, a new endeavor from Karim Manuel Fresno, is launching a series of pop-up shows with an exhibit of the Upsetter’s works. Not only that, but the 78-year-old legend will be on-site, live painting. The invite promises that “his whimsical style will be sure to transform the venue’s ambiance into an unforgettable experience.” No doubt. If you miss the event tonight (it’s from 6 p.m. to 10 p.m. at 513 Johnson Ave., rsvp to karim@keepingstylealive.com to be safe), you can still catch Perry doing what he does best, on stage at Brooklyn Bowl tomorrow evening. He’ll be appearing as part of the Dub Champions Festival, along with Subatomic Sound System.